The Tigers converted only two of ten third-down opportunities against the Bulls. Their quarterback did more damage as a runner (51 yards) than as a passer (59). They scored exactly one offensive touchdown. And yet, Memphis won the game . . . and by 13 points. Credit to a stout defense (particularly AAC Defensive Player of the Week Bobby McCain, he of three interceptions). But let’s measure good fortune when we can. Luck and talent have partnered for a lot of success stories on the gridiron. • Tiger senior Tom Hornsey has now punted for almost seven miles over his four years in blue and gray. The Aussie pigskin punisher surpassed 12,000 yards in the win at USF. 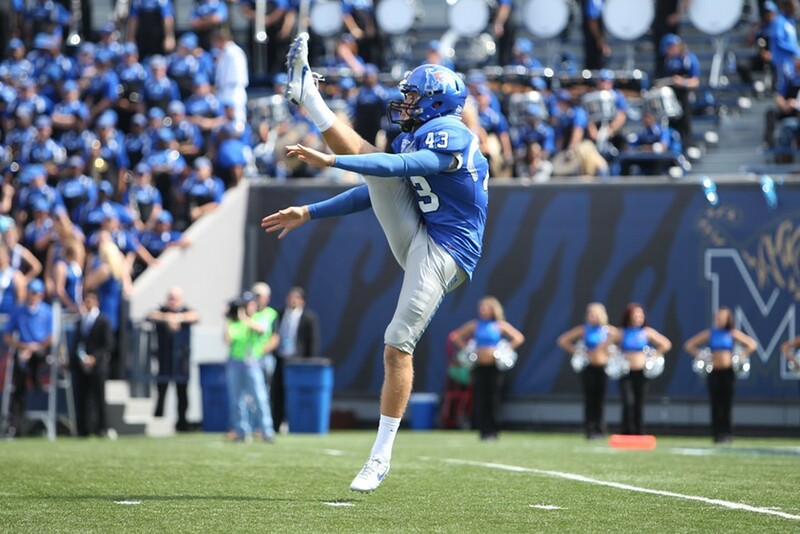 (No other Memphis kicker has reached 10,000.) Such a figure, of course, is an ugly statement on how dreadful the Tiger offense has been over the last four seasons. But imagine what Memphis football would have looked like the last four years without Hornsey. (Yes, folks, it could be worse.) During the USF game, we saw the prototypical Hornsey punt in the third quarter, the Tigers clinging to a 6-3 lead. Sixty yards the ball traveled . . . before being downed at the USF one. Back in August, Tiger coach Justin Fuente summarized Hornsey’s impact with words that would inspire anyone ever charged with saving fourth down: “Tom Hornsey is as versatile a punter as anyone I’ve been around. He’s a real football player.” Give this man the Ray Guy Award. • The best football game I’ve seen live — in the stadium — was the Memphis-Louisville tilt on November 4, 2004, at the Liberty Bowl. This was the height of a Tiger offense built around tailback DeAngelo Williams (200 rushing yards that night) and quarterback Danny Wimprine (361 yards passing and four touchdowns). The teams combined for 1,202 yards (Memphis with 603), 63 first downs (30 for the Tigers), and nine lead changes (the last to the Cardinals, who won the game, 56-49). It was an epic offensive display by two teams off the radar (at the time) of any national title consideration. This Saturday’s game in Louisville won’t be anything like that game. Sadly, it may be the last time we see the Tigers and Cardinals clash on the gridiron for some time. (Louisville moves to the ACC in 2014.) The football series between these schools is nothing like the legendary basketball rivalry, but nonetheless, they’ve played 42 times (the Cardinals own a 23-19 edge). The Tigers have lost the last three meetings and seven of the last eight (Memphis won at Louisville in 2003). It’s a nothing-to-lose contest for the U of M as the 21st-ranked Cardinals hold out hopes for an American title and the automatic BCS berth that comes with it. There have been bigger upsets, right?